New BobCAM for Solidworks Training Video Series helps customers learn how to program machines right inside of Solidworks design software. The issue is not a technology issue, it has to do with learning how to be an expert fast. As a long term SolidWorks Gold Partner, BobCAD-CAM has provided design customers that need CNC Machining technology with the means of creating toolpath and machine code for CNC Milling and Turning without ever having to leave their native SolidWorks software environments. The BobCAM for SolidWorks plug-in works within SolidWorks and allows the operator to streamline productivity by integrating the design and machining processes. To address the elements of affective learning, BobCAD-CAM has released their new V3 Training Professor Video Series for customers so that they can learn the ropes fast and at their convenience. The training series is portable so that customers can use them virtually anywhere, on the road, in their office, or in the comfort of their home. The training series includes 2 CD’s containing an index of 65 individual training videos that educate through demonstration and instruction. Included with the videos is a 450+ page digital workbook containing corresponding lessons that follow the workbook. In addition to the workbook are actual CAD files that are used in the training videos. The company includes CAD files so the customer can practice creating toolpath and g-code programs for their machines without having to spend the time drawing and designing similar parts. By providing part files, customers are able to get up to speed by as much 50% faster. In addition, the training lessons cover all of the machining operations including toolpath machining strategies, simulation, post processing, setting up CAM cutting conditions, tools, material, and much more. "The issue is not a technology issue, it has to do with learning how to be an expert fast," said Sean Owen who oversees the development of training products for BobCAD-CAM, Inc. "This method of training has proven over the years to be a very efficient and effective method for our customers," added Owens. 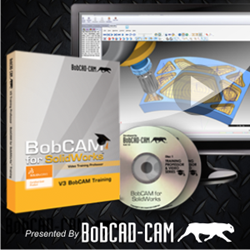 For more information on the new BobCAM for SolidWorks Training Professor Video Series, contact BobCAD-CAM directly at 877-262-2231 or 727-442-3554. The company also provides a free demo download of their BobCAM for SolidWorks CAM plug-in at http://www.bobcad.com. About BobCAD-CAM: BobCAD-CAM has provided CAD/CAM CNC software products to the global manufacturing industry for over 25 years. BobCAD-CAM’s powerful yet affordable software is used to increase CNC productivity for many applications including educational and hobby use. BobCAD-CAM also provides a variety of quality training products that include regional and online training classes or private sessions tailored to specific applications that can result in professional certification as well as multi-tiered technical support solutions to their service customers.